Thought for decades to have been a dry body, in 2009 the Lunar Reconnaissance Orbiter – whose data now accounts for a majority of data in the Planetary Data System – showed that water is distributed widely (if thinly) across the Moon’s surface at times. 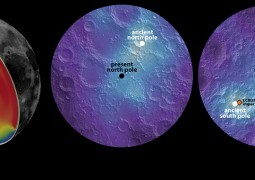 The Lunar Crater Observation and Sensing Satellite (LCROSS) and other data then showed that not only does water exist on the lunar surface, but there is a lot of it—enough (particularly in polar regions) to be used by future human missions. Following these discoveries, NASA is laying the groundwork for a lunar rover that would scout for subsurface volatiles and extract them for processing. The proposed Resource Prospector Mission (RPM), notionally targeted for launch in 2018, would be NASA’s first attempt at demonstrating in-situ resource utilization (ISRU) beyond Earth. The Resource Prospector Mission is intended to pave the way toward incorporating use of space resources into mission architectures. NASA’s planning for eventual human missions to Mars depends on tapping the indigenous resources to make propellant for launching the return ship back to Earth, and a lunar precursor mission is a convenient location to test the ISRU technology. If it pans out, it may revolutionize the way NASA is approaching solar system exploration. These initiatives are part of an evolving space exploration strategy that relies on indigenous resources, primarily to make rocket fuel for the return trip home. The idea is to have a rover scout for areas with high concentrations of subsurface hydrogen and then drill out samples for heating and analysis. The rover will be equipped with instruments– the Regolith and Environment Science and Oxygen and Lunar Volatile Extraction (RESOLVE) payload– to extract oxygen from the lunar regolith and process it with hydrogen to make water. Water is the key to life support, but it can also be used for propulsion. Water molecules can be processed by electrolysis to produce oxygen for breathing or for propellant, while the hydrogen is recirculated back into the system to make liquid hydrogen. If water on the Moon was accessible, it could be feasible to set up fuel depots to help astronauts reach further destinations and long-duration, interplanetary journeys. Luckily, the Moon is 42 percent oxygen by mass in the regolith itself. In the minerals, there is oxygen, as well as rare earth elements used to make key components in smart phones and other advanced electronics. Scientists are planning to heat lunar material to over 900 degrees Celsius and pass hydrogen over it in a reducing environment. Then the oxygen from the granular material will be liberated and join with hydrogen to create water. Scientists have already demonstrated such techniques in field tests and are ready to move to the next step—proving the technology and mining operations on the Moon. If successful, scientists hope ISRU technologies will evolve past demonstrations and into operational missions. Now NASA is seeking external partnerships for joint development of a robotic lunar lander as early as 2018. “The concept of RPM came up out of the need to fly RESOLVE and the near-term, close way to test that would be on the Moon,” said Jason Crusan, director of Advanced Exploration Systems at NASA headquarters in Washington. But RPM will also be testing technologies that we might need to go to Mars and try to mine resouces in a similar fashion. “A lot of the technologies have broader use than just lunar, [but] it’s a convenient location to test ISRU technology,” Crusan added. Resource Prospector is among a handful of NASA lunar initiatives, including an ongoing solicitation for companies interested in tapping agency personnel, equipment, facilities and software to develop landers. NASA expects to select one or more partners for unfunded Space Act Agreements in April for its so-called Lunar CATALYST program. Discussions with Canada for a rover are underway, Crusan said. While NASA intends to partner with international space agencies for Resource Prospector’s rover and lander, if those plans fall through the agency might consider a commercial alternative. Other potential partners are the Japan Aerospace Exploration Agency, which is considering providing a lander, and the Korean space agency, which has discussed a lunar orbiting communications satellite and science instruments. Partnership agreements are expected to be finalized this year. A review to assess if the mission is ready to move forward is planned for this spring.